“Who outside of Syria knows the names Yara Abbas, Maya Naser, Mohamed al-Saeed…? The corporate media has inundated us with news of the two American journalists allegedly beheaded, the first of whose execution video has been deemedfaked. But what of the non-Western journalists and civilians beheaded and murdered by ISIS, al-Nusra, and associated terrorists in Syria, Iraq, Lebanon, Palestine? Why didn’t the August 2012 execution (which some reported as a beheading) of TV presenter Mohamed al–Saeed, claimed by the Nusra gang, create the same outrage? Or the December 2013 kidnapping and point blank execution in Idlib by ISIS of Iraqi journalist Yasser al-Jumaili? Maya Naser, Ali Abbas, Hamza Hajj Hassan (Lebanese), Mohamad Muntish(Lebanese), Halim Alou (Lebanese)…all were media workers killed by the Western-backed insurgents in Syria. Their deaths were reported by local media, some even got a passing notice in corporate media, but none resulted in a media frenzy of horror and condemnations as came with the alleged killings of Westerners. Another at least 20 Arab journalists have been killed by NATO’s death squads in Syria in the past few years. In Syria, there are thousands of civilians and Syrian soldiers who have been beheaded—and in far more brutal and realistic manner than the SITE videos insinuate—by the so-called “moderate” Free Syrian Army (FSA), al-Nusra, Da’esh (ISIS), and hoards of other Western-backed mercenaries. At the hands of the various NATO-gangs, tens of thousands more civilians have been assassinated and subjected to various sadistic practices—torture, mutilation, crucifixion, burning in ovens, throwing into wells, and a sick lot more. Thousands more, including children and women, remain missing after being kidnapped during mercenary raids and massacres. Nidal Jannoud, a farmer from Banias (southwestern Syria), was one of the earlier victims of “moderate rebel” assassination. Jannoud was tortured and slaughtered by “peaceful demonstrators” in April, 2011. Omar Ayrout and Yahya Al Rayes confessedlater that they aided a mob in killing Janoud. “I heard gunfire and saw a group of people detaining Jannoud….I took a knife from Taha al-Daye and stabbed Jannoud in his right shoulder…Then the group attacked him with knives and mutilated his body afterwards,” Yahya al–Rayyis confessed. In the case of the organ–eating al–Farouq Brigade militant “Abu Sakkar,” who bit into the lung out of a Syrian soldier, there was corporate media notice and general horror. Yet, very quickly corporate media like the BBC, The Guardian, TIME, among others, rushed to justify his cannibalism (see: Face–to–face with Abu Sakkar, Syria‘s ‘heart–eating cannibal‘ and BBC whitewashes Syria ‘heart–eating cannibal‘ to justify armingal–Qaeda). How the tides would have turned if the lung in question belonged to a Western soldier, or worse, an “Israeli”soldier… would the BBC have then humanized the perpetrator of this barbaric act? Would the world have so quickly moved on, forgotten? Of course not. Apart from the thousands more individual slaughters, there are also numerous massacres, mostly overlooked or simply lied about in the media. “…our eyewitnesses say Sunni rebels took hundreds of Alawite civilians as prisoner,” noted Thomson, also writing, “They all insist…rebels from the Free Syrian Army (FSA) corralled around 500 Alawite civilians in a large red-coloured two-storey house…” kept there for 11 days. According to a Latakia resident, with friends and a home in Kassab, 88 Christians were murdered, 13 of whom were beheaded, others who were shot dead on the spot. Another 22 elderly were kidnapped and taken to Turkey where they were held for about three months before being released into Lebanon. The fact that Christians were murdered by foreign mercenaries, let alone beheaded, should have created shock waves in the media. But, not surprisingly, it has had the exact opposite effect, because spotlighting those crimes doesn’t serve the West’s stated agenda to overthrow President Assad, to dismember Syria as the NATO-backed takfiris are dismembering Syrians. The assault took place by roughly 20 coordinated factions, including ISIS, Jabhat al-Nusra, and the so-called FSA (with the knowledge and approval of the SNC’s George Sabra). But, there was no outcry by the humanitarian, would-be interventionalists and their public. In the face of mounds of evidence, eyewitness testimony, mass graves, doctor and coroner reports of death by throat slitting, the massacre in Latakia resulted again in none of the fervor that we’ve seen in recent months…in spite of 220 civilians being brutally massacred, another 100—mostly children—abducted by the West’s freedom-loving terrorists. Twenty km north of Damascus, Adra industrial town suffered horrific atrocities that went largely unreported in the corporate media. The town came under Jabhat al-Nusra and Liwa Al-Islam insurgents attack on December 11, 2013, Russia Todayreported, massacring at least 80 residents. In addition to the massacre of entire families”, bakery workers were executed and “toasted…in ovens used to bake bread ,” an Adra resident told RT. In Latakia city in April, 2014, I met refugees from Harem, a northwestern city 2 km from the Turkish border, who had fled after Harem came under attack by McCain‘smoderates, with the help of Turkey. 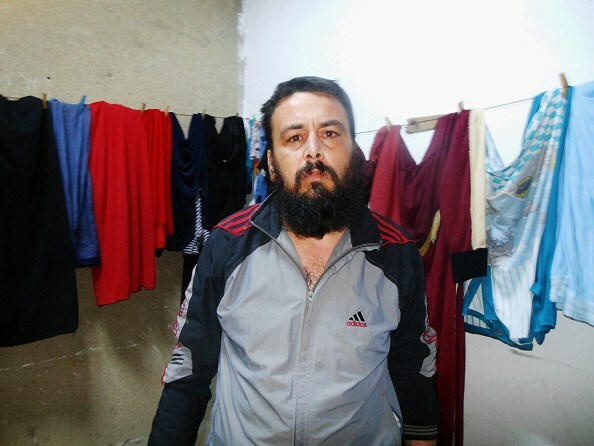 Harem refugee in Latakia centre speaks of atrocities committed by foreign insurgents. Photo by Eva Bartlett. The August 28 and September 6 beheadings of Ali al-Sayyed and Abbas Medlej respectively, and the September 20 execution of MohammadHamiyeh, all Lebanese soldiers (captured with another 16 other soldiers) by ISIS and al-Nusra. And this is the point. The murders of non-Westerners—whether in Syria, Palestine or elsewhere—doesn’t matter to the media and public, unless it serves an Imperialist or Zionist agenda. In fact, supremacism and racism aside, the only reason the alleged-beheadings of the two Western journalists, among others, is really being trumpeted and shoved down our fear-mongered throats is that these questionable stories serve perfectly the Axis-of-Destruction’s agenda: a justification to bomb Iraq and Syria, to re-invade, to attempt to implement the Yinon Plan. Sharmine Narwani’s article on the killing of Yara Abbas. October 28, 2014 in Sryia.